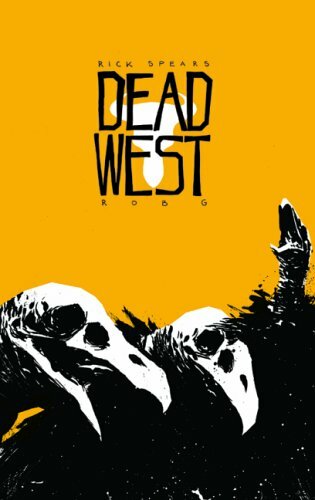 Today I am reviewing Dead West by Rick Spears. The story starts two years after an Indian tribe is wiped out by American settlers who want to build a town. The settlers massacred almost all of the women and children while the men were out hunting. When the men returned, they attempted to protect their families, but they were all killed as well.Years later, when the town had been built, the sole Native American survivor of the massacre comes back to the town and practices a ritual that turns all of the town's dead into zombies. The rest of the book follows the settlers’ attempt to survive the zombies. 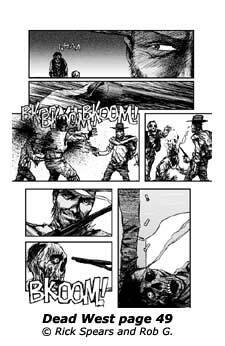 There is also a storyline concerning the Native American and his zombified father. Apparently his pappy doesn't approve of turning the town into a zombie infested hell hole, even though he himself is a zombie. 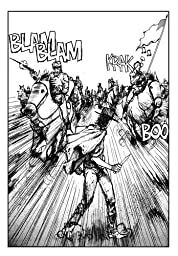 One scene I really like is when the calvary comes and starts fighting the zombies. What can I say? I'm a man who loves action. There’s not much artistic vision to this scene. It basically just looks really cool. I really love when the first of the soldiers becomes a zombie after being killed. He gets up and looks one of his comrades in the eye, then starts digging in. I think a big reason I like this scene is because the other soldiers have no idea why this is happening. They don't understand why their fallen comrades are getting up and attacking them. I warn you though, this scene is pretty violent and bloody. The art in this book is very creepy. The zombies look very flaky and dry. The people have lots of sharp angles and they all have off-putting grim expressions. Their faces really add to the dark, scary aura that this book generates. As with the scene above, there is a lot of blood throughout and it's quite realistic and violent. I would strongly suggest reading it yourself before you give it to a child or someone with a weak stomach. Apart from the gruesome violence, Dead West is a very entertaining read. The characters are captivating, the storyline is engaging, and the art is beautiful. If you see a copy in a library or bookstore, get it. It’ll keep you entertained for an hour or two. I would give Dead West 7 zombified gunfights at the Ok Corral out of 10. Awesome review, Milo! As a writer currently working on a zombie story, I'll say the conceit to this one is one of the best I've encountered. I love the idea of some kind ancient witchcraft as retribution for one of our national original sins (not that I want to be retributed myself, of course). Well written, and very engaging. I want to read it!